Ancient Roman Geography was in many ways the secret of its future success so much so that even Roman writers, including Cicero, recognized how fortunate the choice had been. What is particularly interesting is that Rome, at odds with most other Italian cities, is built on a relatively low ground rather than on a dominating high ground. 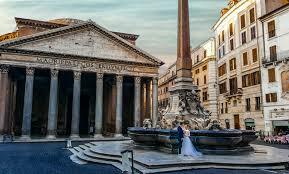 The lowest point of the city is at the Pantheon (approx 13m above sea level). The highest is Monte Mario hill (120 m asl). An interesting comparison may be had with the geography of ancient Pompeii which although close to the sea was essentially built on the side of a mountain on a spur of lava flow with a dominant position over the sea and the river Sarno. Perhaps Rome’s location has more in common with ancient Etruscan cities which, like Rome, relying on their access to the sea for international trade. 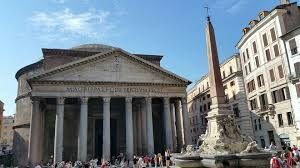 It is Rome’s proximity to the sea which explains the relatively low height above sea level, the Tiber River’s meandering bends and the marshy nature of the land. The marshes meant that the first inhabitants tended to congregate on the steep hills which had been cut out by erosion. Being an area of volcanic origins the soil is naturally rich in water springs and minerals. The hills themselves were (are) largely made of tufa rock- a sort of hardy rocky sponge. This type of stone was widely used for ancient Roman building and construction, for example, to build foundations, the earliest walls of the city or even as part of wall construction – opus reticulatum. It is still widely used in modern day construction. The Roman Geography was characterized by relatively steep hills on the left bank of the river Tiber, at the point where the river flowed around a small island (16m asl) as well as branching out into marshy areas between the hills. In a sense, the Tiber Island itself is a hill. 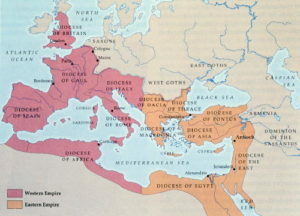 The marsh areas were drained and developed into the Forum Boarium – the meat market and the first port of ancient Rome. At that time the river was still navigable by Roman ships. Other parts of the marshes were drained to allow the city to grow between the hills. The most notable examples were the marsh between the Palatine and Aventine which became the Circus Maximus, with wooden seats along the hillsides of what was the marsh. The extent of the marshes and the tendency to flood was at the root of the Roman ability for hydraulic engineering which actually they learned from the Etruscans whose kings ruled the city and area for some time. Flooding of the river (and city) was only put to a stop after high banks were built during the 19th and 20th century. The marshy nature of Rome is largely hidden to the visitor’s eye although modern day Romans who own a cellar are well used to extremely damp conditions. The marshes are also clearly remembered as an integral part of the myth of Rome’s foundation. This particular marsh was known as the Velabrum. The cloaca maxima and other drainage systems are still in function and the flowing water within them can still be heard by those visiting subterranean Rome. In the early days, the hills were really hills, with time and continuous building works they’ve tended to blend into one another. The first two hills to be populated were the Palatine and Capitoline but the city soon extended to include the Aventine, Caelius, Oppius, Viminalis and Quirinalis and others. The move across the river was largely prompted by military defense needs. Some of these hills were actually made up of a couple hills each with their own name. The most renowned across the river is the Janiculum and Vatican. A curious hill is “Testaccio” which in reality is a man-made hill entirely made of carefully laid out broken amphora pieces (the amphorae were the ceramic containers used for commerce). This hill per se gives a pretty good idea of the extent to which man has come to alter the original geography. Other hills have come to be virtually dug out or eliminated as part of continuous urban development, for example, the Velia hill.